A crosssection view of participants at the meeting. BASSETERRE, St. Kitts – The United Kingdom’s (UK) withdrawal from the European Union (EU), also known as “Brexit,” is an emerging trade issue that is of paramount concern for the Caribbean region. Against this backdrop, a number of government ministers and delegates from CARIFORUM countries are currently in St. Kitts-Nevis attending a two-day special meeting of the CARIFORUM Council of Ministers. 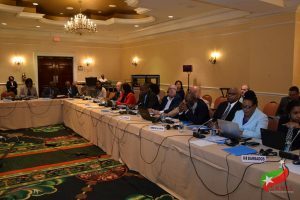 CARIFORUM Director General Percival Marie said that the meeting is timely and extremely vital. “The meeting is held at a crucial time when post-Cotonou negotiations between the African, Caribbean and Pacific (ACP) group of states and the European Union are about to commence,” he said. “This meeting is also held when the European Union and the United Kingdom are in discussions on the exit of the United Kingdom from the European Union. 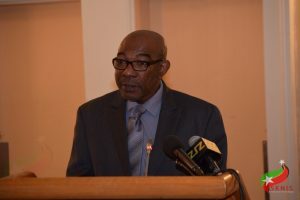 In delivering official welcome remarks, the Honourable Mark Brantley, premier of Nevis and minister of foreign affairs and aviation in the federal government, stated that all can agree that the region serves at a time when the “tectonic plates in which our engagement with the European Union continue to shift. It is a time which requires us to simultaneously, one, grapple with implementation of a CARIFORUM-EU Economic Partnership Agreement (EPA); two, assess the impact of the exit of the United Kingdom from the European Union – Brexit, in an effort to mitigate against; three, ensure the rollover of the EPA into a CARIFORUM, United Kingdom Free Trade Agreement, preserve the level of market access into the United Kingdom market…; and four, consider our options for future engagement with the European Union, Africa and the Pacific in the post-Cotonou era,” said the foreign minister. According to data from CARICOM’s website, CARIFORUM refers to the body-comprising Caribbean ACP states, which are signatories of the Georgetown Agreement, signed in 1975. The grouping is composed of 79 African, Caribbean and Pacific states. All participating states in CARIFORUM, with the exception of Cuba, are signatories to the ACP-EU Partnership Agreement or “Cotonou Agreement” and the EPA, respectively. CARIFORUM states include Antigua and Barbuda, The Bahamas, Barbados, Belize, Cuba, Dominica, Dominican Republic, Grenada, Guyana, Haiti, Jamaica, St. Kitts and Nevis, Saint Lucia, St. Vincent and the Grenadines, Suriname and Trinidad and Tobago.